How To Give Yourself A Trendy Ear Makeup? What Is ‘Ear Makeup’ All About? 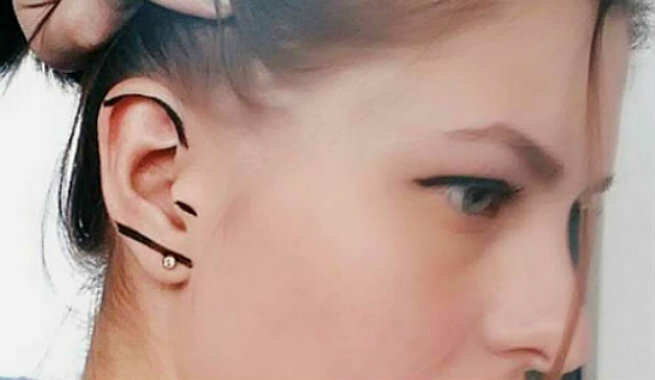 Ear makeup is the craziest form of body art we have ever seen. It is a badass version of contouring (without bronzer and highlighter though) in which the lobes, edges, and / or the natural curves of ears are painted with vibrant shades or shimmer / glitter in order to lend an artistic touch to the organ. Taken straight from the runways, the ear makeup trend has gained momentum as an edgy alternative to jewelry like dangling earrings, fancy studs, or pretty cuffs. The best thing about ear makeup is that it can be turned into a true ‘arts and crafts project’ as there is no hard and fast rule. All you need to do is to get some eye liners, eye shadows, or simple body paints and you will be all set to give your ears a quick update. The killer ear makeup trend started taking off almost two years back in 2014 when the famous designer Anthony Vaccarello decided to come up with a bold statement at Paris Fashion Week. While his models were marching down the runway with awesome threads and least makeup, all we could do was to stare only at their blacked-out ear lobes. It was a simple graphic style featuring the earlobes painted with black liner, but it was really hard to miss! 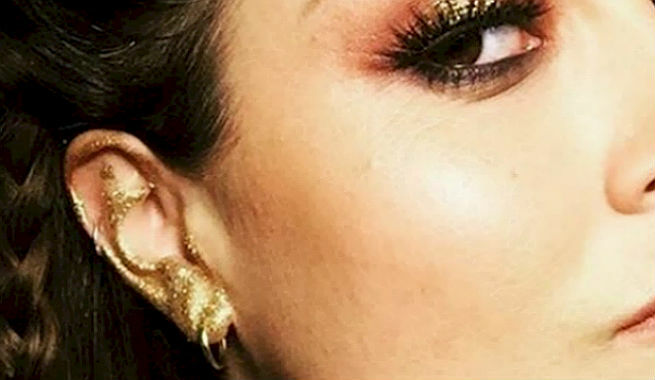 After its debut, the ear makeup trend became an instant hit when the ‘runway makeup guru’ Tom Pecheux opted for a ‘quasi-jewelry look’ by giving the runway models a glittery ear makeover just like a second-skin cuff. The absurd trend has popped again this year as the renowned runway makeup artist Yadim showcased ‘full-on glitter ears’ for the Opening Ceremony during fashion week. Models for the major brands like Proenza Schouler were spotted rocking graphic white and yellow painted earlobes while rocking chunky geometric earrings at New York Fashion Week. It was even followed by the ‘makeup goddess’ Pat McGrath, who created a silver / metallic statement ear for Louis Vuitton Spring 2016. And now, the eye-catching trend is all set to go ‘mainstream’ by taking over the Instagram, thanks to French makeup artist Violette Wautier. Her metallic ear highlights are pretty wearable take on this unusual, high-fashion style. She has created a couple of exclusive ear looks for the CR Fashion Book and posted a few more interesting ear makeup ideas too. How To Do Ear Makeup At Home? Take a small piece of tape and stick it to the skin right above your earlobe. The part of ear visible below the tape is your canvas. Hence, make sure that you keep enough space there. Get the favorite shade of your go-to liquid eyeliner and apply a thick solid coat of it to your earlobe (precisely, the whole part below the tape). If you want to draw a neat line, the edge of the tape will be immensely helpful. Let the eyeliner dry up completely. Dip the tip of your index finger or a small cotton ball into the glitter of your choice and press it onto your painted earlobe. You’re done! Keep it subtle with a single stroke of a metallic color (silver, copper, bronze, etc.) across your lobe. Create a small gold hoop by painting your earlobe with a metallic gold. Trace the outlines of both your inner and outer ear with a silver liner. 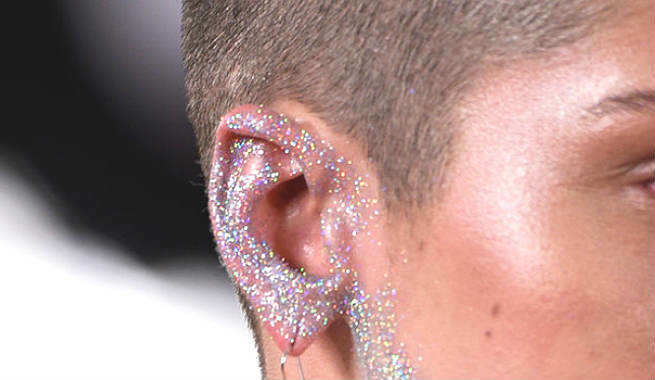 Cover your entire outer ear with some sparkling glitter. Draw a few geometric lines on your ear with a liner pencil or simply outline your whole ear. For a bold statement look, cover your entire ear with a foil-like paint. Just make sure that you are not wearing the milder shades of red, blue and purple on your ears as these might give an infected look. So, are you ready to say ‘hello’ to ‘ear makeup’?